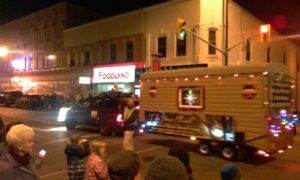 Another good Christmas parade. 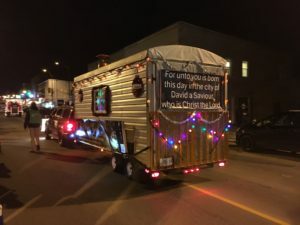 Our float this year had the text “The Lord is my light and my salvation” emblazoned across the front. You can see another view in this pic. Once again we were glad to hand out hundreds of candy canes, with brief Gospel verses about the birth of Messiah attached. After the Parade we invited visitors to the Library basement as usual, to warm up with hot chocolate or hot apple cider, and some excellent cookies! Although we share in the fun of the season, we know that for God the Father the birth of Christ was a very serious event, upon which would hang the eternal future of every human being. Praise God for the plan of salvation!